This is a striking moment. Please tell us a little about the backstory. Thank you. It's an honor to be a part of TID. This was my third year in a row covering South Carolina in the College World Series. There was a lot riding in the final series as the Gamecocks were going for their third title in a row. Although they had a strong team, Arizona had been overwhelming their opponents on their way to the finals. This was game two of the best-of-three series. South Carolina was down one and needed to win. I had covered South Carolina's previous two national championship runs so I was familiar with the stadium and environment. Still, being a one-man team has its challenges. 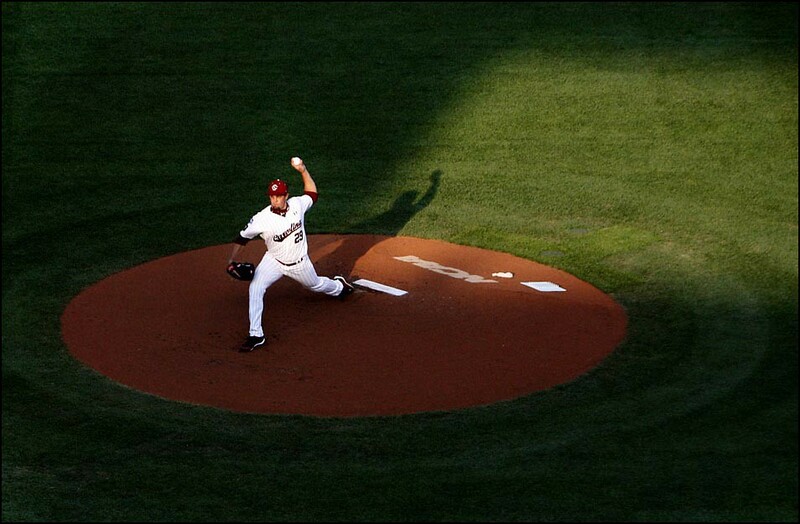 The best preparation for baseball is knowing all the shooting angles. You have to plan out your shooting positions, which includes setting up remote cameras. I arrived early and set up an overhead camera focused on the pitcher's mound. I headed to the first base shooting position at the start of the game. It's important to prepare mentally. I went through every game scenario and outcome while in my hotel room the night before. It's an important process for me. A baseball game can change in an instant. One at bat, one walk can change the outcome. So you have to think of everything. I documented the team's run through the season so I knew their tendencies. I had a good idea where their closer turned when he celebrated, which player had the best expressions, etc. Every detail helps when covering a team. Well, it can be a nerve-wracking experience covering a major sporting event so you have to remain calm. I've seen shooters get too wound up and it has an adverse effect on them. 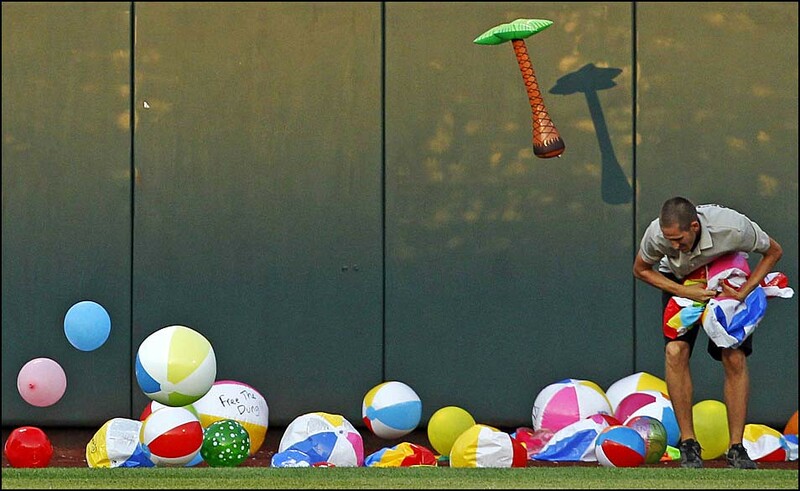 Baseball is also a game that can lull you to sleep and then all of a sudden a big catch happens. So staying alert is key. Luckily there was plenty of non-action activity throughout the night, including an array of fans running onto the field and a beach ball fest out in left field. The biggest challenge though, is figuring out a way of separating yourself visually. Every photographer is going to get the final celebration dog-pile. 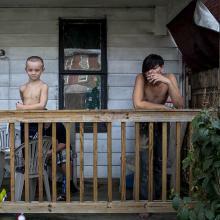 I'm more interested in finding an image that tells a story, yet is unique and visually interesting. Your artistry should never take a back seat just because it's a sporting event. There is always a gem to be found. Covering a big sporting event, I know I'm going to miss some shots. It's just the nature of the beast. So I relax, trust my instincts and enjoy the experience. I know it sounds easy but it's true. I've gone through all my preparations by the time the game begins. Not to say there aren't surprises. But for the most part I've taken care of everything technical by game time. Instinct and artistry should now take over. That and embracing the challenge. Now, onto the moment. Can you talk the time leading up to the picture and also the actual moment? The pressure was mounting as a tight 1-1 game went to the ninth inning. The energy was palpable. It was tight in the first base photo area so I decided to head up to a front row seat above the first base dugout. I had a clear view and wouldn't be blocked by a first base coach or umpire. That was my first instinctual move and it paid off when Arizona's Robert Refsnyder leaped as he scored the first of four runs in the ninth. South Carolina was now down 4-1 and I knew I wanted to be closer to their dugout for their last at bat. I moved to the third base side photo well in between innings. That was my second instinctual move, which paid off. 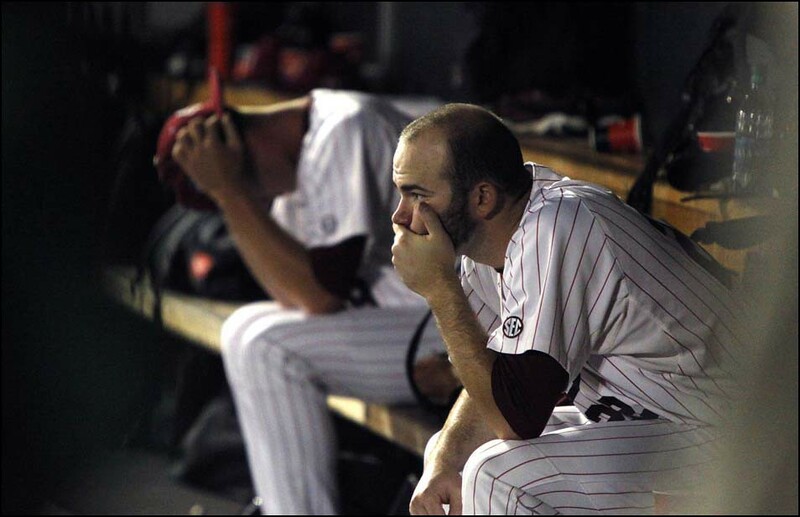 The first image I came across was of two dejected South Carolina pitchers on the bench. A final pop up ended the game and Arizona started celebrating. Thus begins the crucial moments after a championship. It is chaos and you have to remain calm. Ideally you search for an image that is layered and incorporates agony and joy in one frame. In the midst of my searching, a lone South Carolina player caught my eye. 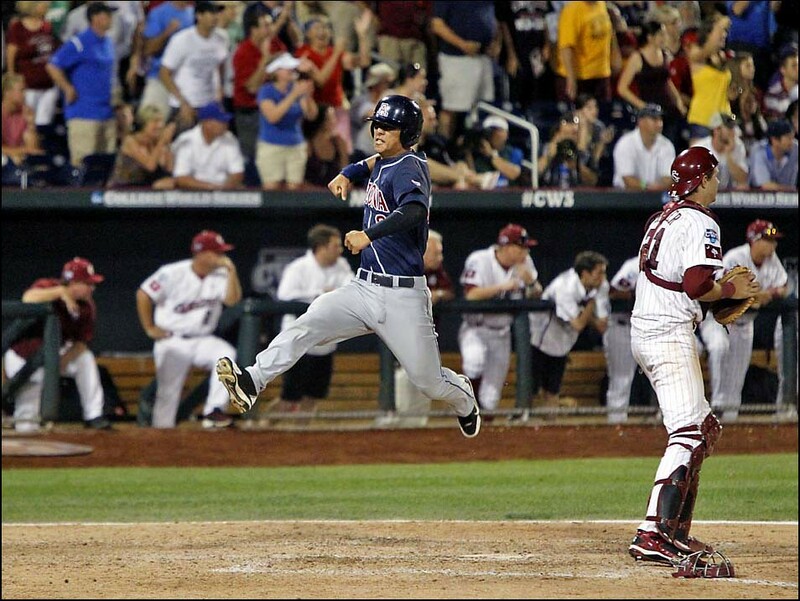 As he walked back to the dugout, he looked back at Arizona's celebration and weaved past another teammate. 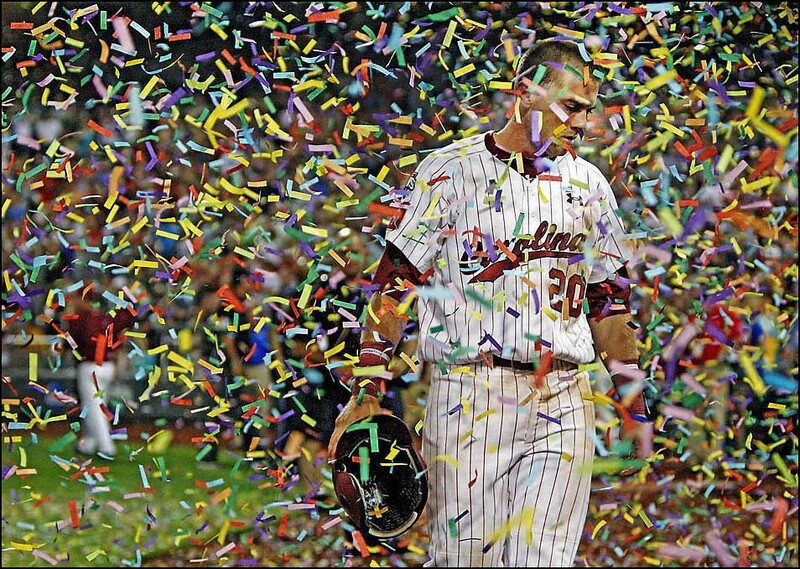 It was a surreal yet poignant moment of a defeated player slowly walking through cascading confetti. I committed to this moment and hoped my decision would pay off. I remember thinking how peaceful it was. Everything seemed to move slower than normal. Initially there was a decent amount of confetti falling but as he got closer to me it became like rain. 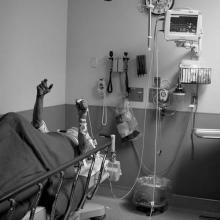 You can see the difference in the contact sheets. It's just one of those things that comes together and there's no real explanation for it. Looking at the image now it does take on a painterly quality. The best frame was also the last before I moved on to another scene. 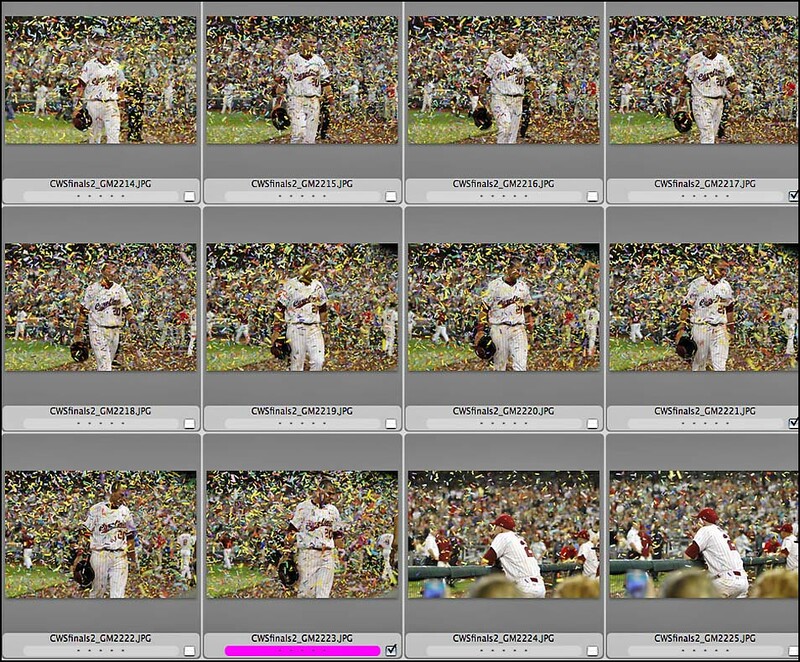 On a technical note, falling confetti and auto-focus do not mix. Luckily, a few worked out. What have you learned about yourself throughout the years in covering major sporting events like this? I push myself, even when I'm drained mentally and physically. There's always an easy road in photography, right? Sports is no different. I've taken that road before and truly felt terrible after. I mean I have this gift of seeing. And in the end ,I'm responsible for it. In sports, it's all about preparation, hard work, instinct and a little luck. Don't get discouraged if you miss a shot, because it will happen. Set yourself up to succeed and good things will happen. Trust your instincts and push yourself to be better. There's nothing worse than feeling like you could have worked harder. Complacency is the devil on your shoulder. If you want to be a better sports shooter, there's nothing better than learning from one. There are so many great workshops now and photographers are so accessible these days. Find one you admire and send him/her an email about their approach. You can never stop learning. and dad to son Will, 7, and daughter Ava, 9.